Our clients can avail from us an array of Medical Aprons which are worn by doctors, nurses and other healthcare staffs. These are designed provide proper movement during operations and are available in various sizes. 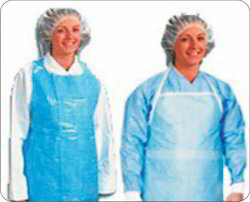 Our range of product includes medical aprons, surgical gown, shoe cover and caps non-woven. Owing to our profound experience in the industry, we have been able to offer Medical Aprons. Manufactured using excellent quality raw material, these products are appreciated for their durability and optimum quality. These products are demanded in various hospitals and clinics and are appreciated widely by the customers. These are available at industry leading artes to our customers.